GET READY FOR NEW PRODUCTS!!! It is almost time to get some new and exciting products from the Holiday Catalogue which becomes live on 1st September!!! There are so many amazing new products and wonderful ideas, you will get your Christmas mojo into action so you can get all those projects made for the up coming Christmas Season which will be here before we know it. 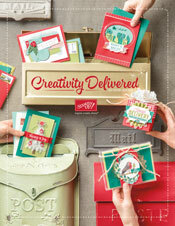 If you would like your own copy of the Holiday Catalogue just send me an email and I will send one out to you.